484 pages | 113 B/W Illus. Cancer is a complex disease process that spans multiple scales in space and time. Driven by cutting-edge mathematical and computational techniques, in silico biology provides powerful tools to investigate the mechanistic relationships of genes, cells, and tissues. It enables the creation of experimentally testable hypotheses, the integration of data across scales, and the prediction of tumor progression and treatment outcome (in silico oncology). Drawing on an interdisciplinary group of distinguished international experts, Multiscale Cancer Modeling discusses the scientific and technical expertise necessary to conduct innovative cancer modeling research across scales. It presents contributions from some of the top in silico modeling groups in the United States and Europe. The ultimate goal of multiscale modeling and simulation approaches is their use in clinical practice, such as supporting patient-specific treatment optimization. 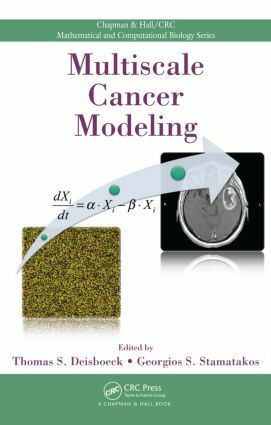 This volume covers state-of-the-art methods of multiscale cancer modeling and addresses the field’s potential as well as future challenges. It encourages collaborations among researchers in various disciplines to achieve breakthroughs in cancer modeling. "This volume covers state-of-the-art methods of multiscale cancer modeling and addresses the field's potential as well as future challenges … It presents contributions from some of the top in silico modeling groups in the United States and Europe."